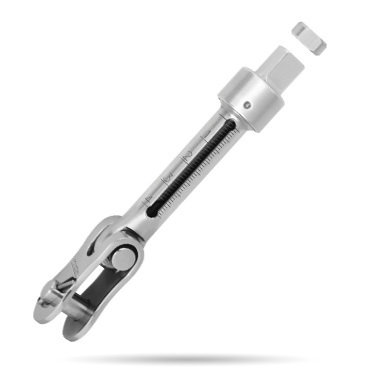 For accurate, repeatable settings of rig tension and precise adjustment, calibrated turnbuckle models are available for wire sizes up to 6mm (1/4"); thread sizes 1/4", 5/16", 3/8" UNF. Matching threaded ends have rolled threads Ronstan rigging fittings have rolled external threads for maximum strength and reliability - unlike cut threads, the stainless steel bar is formed up and down to create a thread with the grain remaining unbroken and flowing the full length of the thread. Threads are UNF (Unified National Fine), short pitch threads for fine adjustment and reduced adjustment effort. Matching swage fittings suit industry-standard roll swaging presses and dimensions are derived from the original 'Milspec' for maximum integrity. They are suitable for use with modern and traditional wire constructions, including 1x19, 7x19 and compact strand.